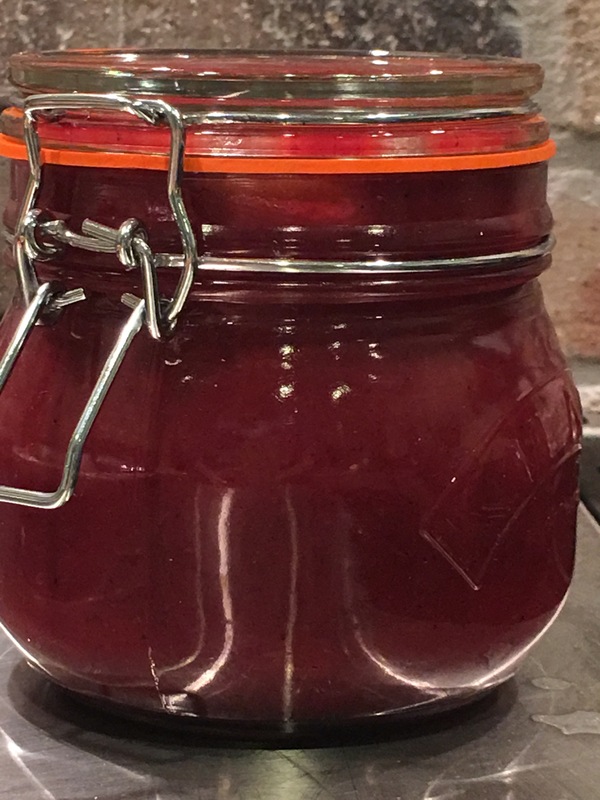 Cranberry Catsup. I can’t say how happy I am with the result. If you know the movie “Meet Me in St. Louie,” the opening scene is of the family preparing their annual bottling of catsup. “Too sweet,” says someone tasting the cooking catsup. They adjust the sauce and leave. Then somebody else comes into the kitchen from their day, takes a taste from the pot of cooking catsup and says, “Too sour!” and then adjust the sauce and leave. It’s a wonderful homey scene that makes us smile. 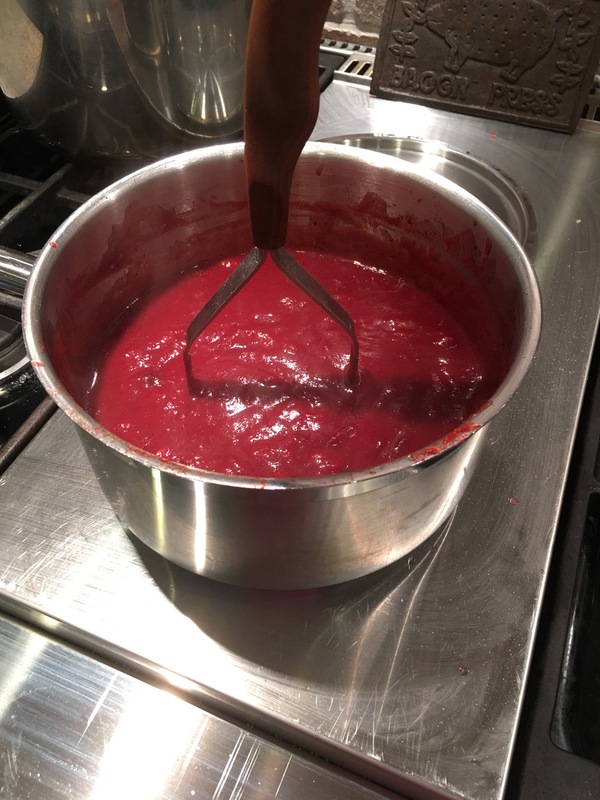 So here’s our home made catsup, with a twist for the approaching holidays. Have it with anything you like ketchup with or turkey and poultry for that matter. I’m going to add Grand Mariner next time. It’s 5 stars and sure to wow you. 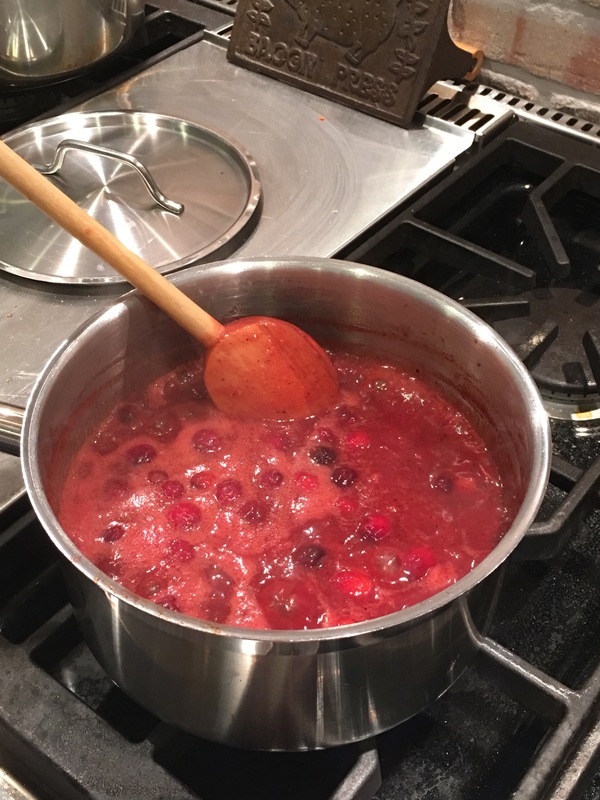 Cranberries, tomato paste, apple cider, balsamic vinegar, white vinegar, sugar, orange concentrated juice or your own fresh squeezed and zest, salt and pepper, ground clove, cardamom & cinnamon. Cook to a simmer and reduce until your wooden spoon coats nicely. Break the cranberries and stir so it doesn’t burn or stick. Taste and balance out too sweet or too sour. Make sure to add enough salt as not enough leaves it unbalanced no matter what you do. Optionally, add a little powdered garlic or fresh garlic at the beginning to allow it to cook. To have a smooth sauce use your immersion blender and strain. Refrigerate for up to two weeks. I’m not kidding, it’s out of his world better than store-bought ketchup. Putting it in a cute little bottle doesn’t hurt.